Growing up we spent many a Sunday afternoon down at the "the rock" (as we called it) below Something Good. You know the one I'm referring to. 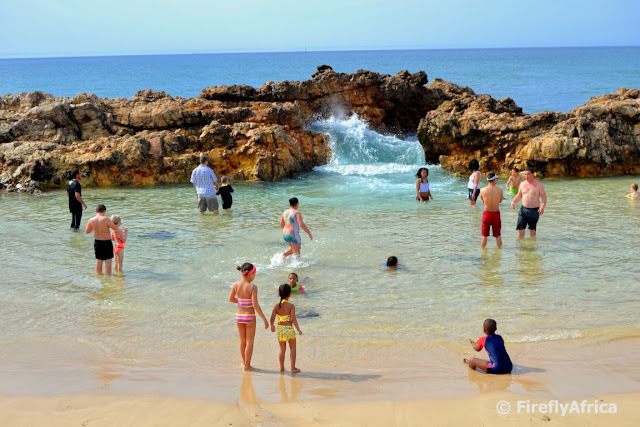 The one where the water washed through between the rocks and into the little natural tidal pool. Yes, the one in the picture. Stopping by there on Sunday I realised that we've never really brought our kids to swim here and although it was a glorious summers winter day, I think we may wait till proper summer when the water is a little warmer. 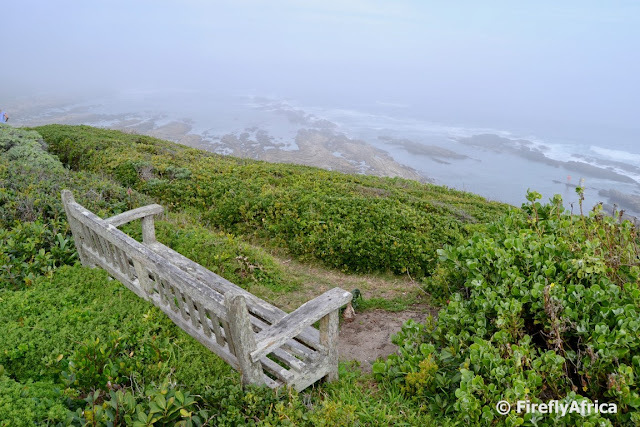 Yesterday we took a drive around Marine Drive to Schoenmakerskop and after a walk to the Oceanos lifeboat ended up having a picnic with this stunning view. Just another reason I love this beautiful city we live in. Any visitor from outer space who landed up in Port Elizabeth over this weekend would have been very mistaken to think that it is the middle of summer. With temperatures touching 30C, people seem to be have summer withdrawal symptoms and flocked to the beaches in numbers you rarely see in summer. Check out how packed Pollok Beach was on this Sunday afternoon. It's winter... or wait, perhaps summer. 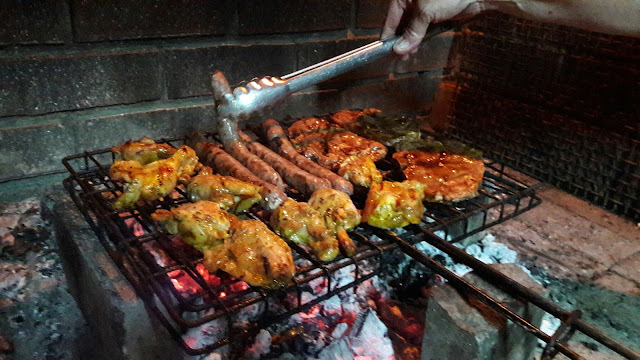 With the temperature hitting around 30C today the perfect end to this lekker day was a lekker braai. This week's Video Friday post is another featuring a video by Chasing the Rainbow. In this one they explore the southern and western outskirts of Port Elizabeth while traveling along the Sunshine Saunter. If you continue along the beachfront walkway past the lollipop beacon onto the boardwalk it feels like the coastline suddenly transforms. You feel just that little bit further away from the city. I did it during the week early one morning and there wasn't another soul around until I encountered another walker on the way back to my car, but if you feel wary doing it when it's this quiet, do it on a Saturday morning when there are more walkers about. It's really worth it. This morning I had the honour and privilege to be involved in the organising and execution of the Port Elizabeth leg of the Travel Massive / National Department of Tourism #womenintourism breakfast event at the Summerstrand Hotel. It coincided with Women's Month and we made use of the opportunity to celebrate the involvement of women in the tourism industry. The theme of the event was Doek on Fleek and most of the women in attendance were wearing a doek with all kinds of styles and colours being represented. Out of a total attendance of about a hundred people, there were only 6 or so men and as one of the organisers and speakers even I donned a doek... or rather a bandana. 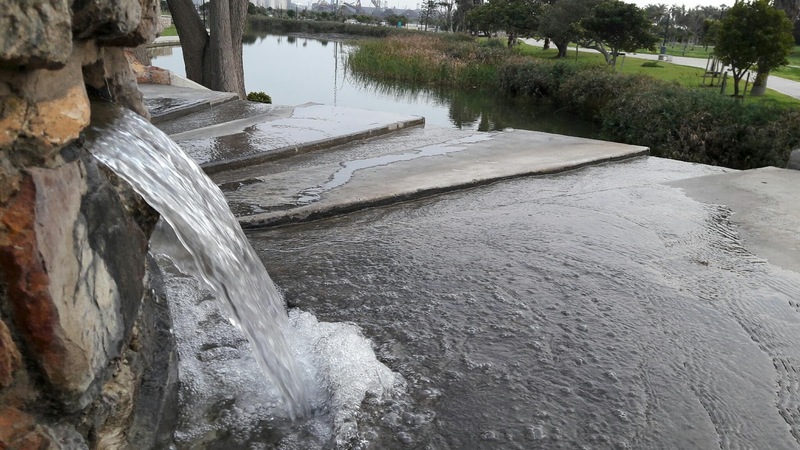 The event was one of five simultaneous events with the others taking place in Cape Town, Johannesburg, Durban and Nairobi, Kenya. Have you ever walked further along the beachfront boardwalk than the lollipop beacon on the corner of Admiralty Road and Marine Drive. This morning I had 20 minutes or so before a workshop at the Summerstrand Hotel and decided to venture a little further down than usual. A beautiful morning with the sea on the one side and among the coastal vegetation yet less than 100 meters from Marine Drive. 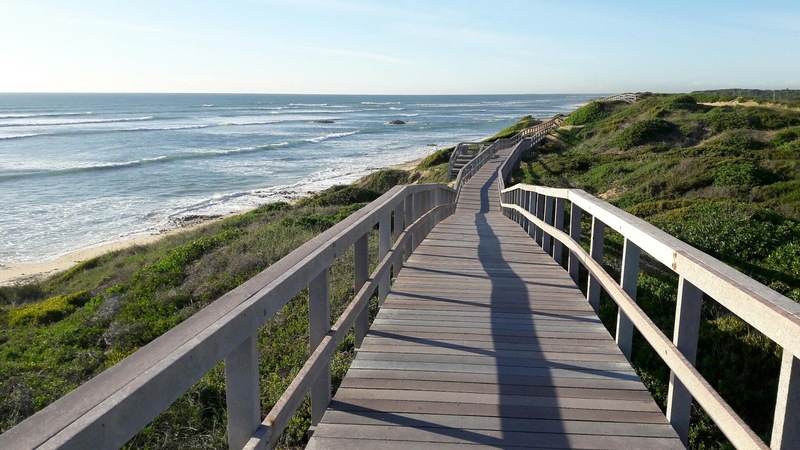 What an awesome asset the city has in this stunning coastline. Just yesterday I asked somebody if they also thought that we didn't have a very cold winter this year as I stood sweating in the sun outside the lodge at Mount Camdeboo Game Reserve outside Graaff-Reinet. This morning we woke up to a freezing wind and snow on the mountains in the area. On my way back this afternoon I heard it hailed in some parts of Port Elizabeth. 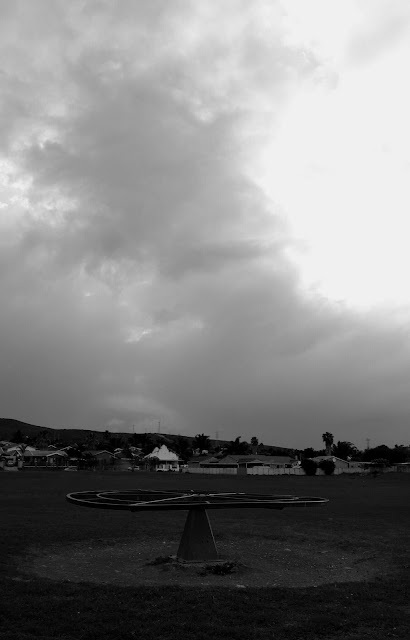 I pulled off the freeway and made a quick stop in Despatch (for a Geocache) and snapped this pic of an empty play park and the approaching clouds. Cold and abandoned. In black and white it feels even colder. Winter just reminded us that she's still here and not leaving just yet. 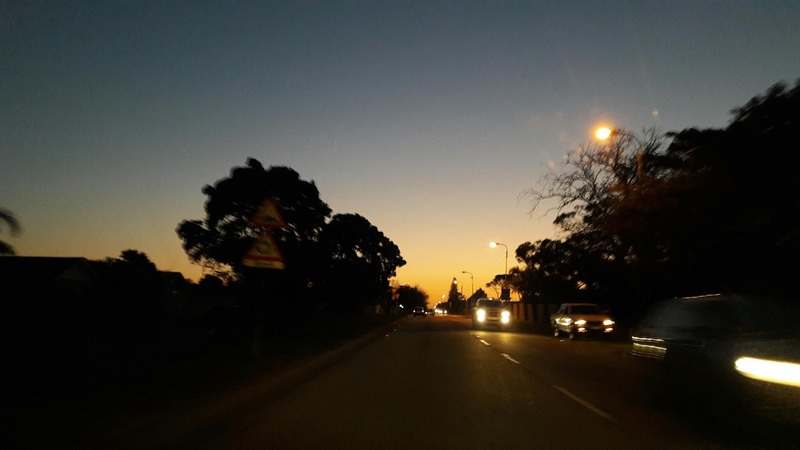 Every now and then I post a photo or two that wasn't taken in Port Elizabeth or the greater Nelson Mandela Bay. Normally it's because I have run out of PE photos or haven't had a chance to take one. Today is one of those days. I'm posting this from Mount Camdeboo Game Reserve outside Graaff-Reinet where I am attending the Karoo Heartland AGM tomorrow. 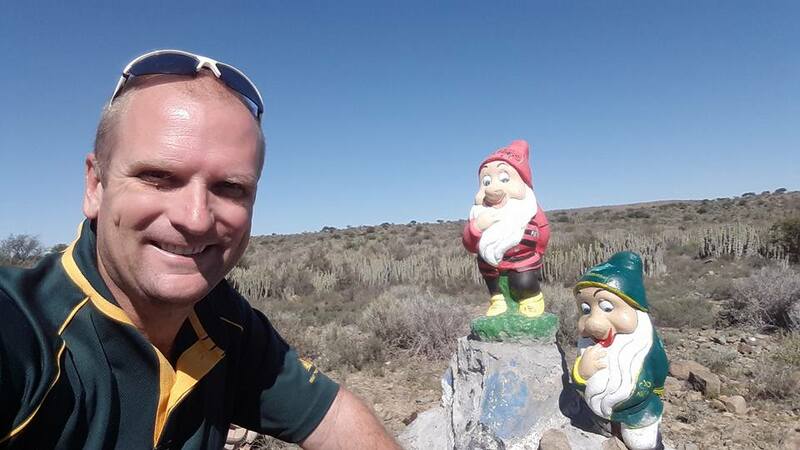 On my way here I stopped at my favorite two Karoo gnomes a few kilometers south of Jansenville to discuss rugby (seeing that they are dressed in EP Kings and Springbok colours), tourism and the meaning of life. 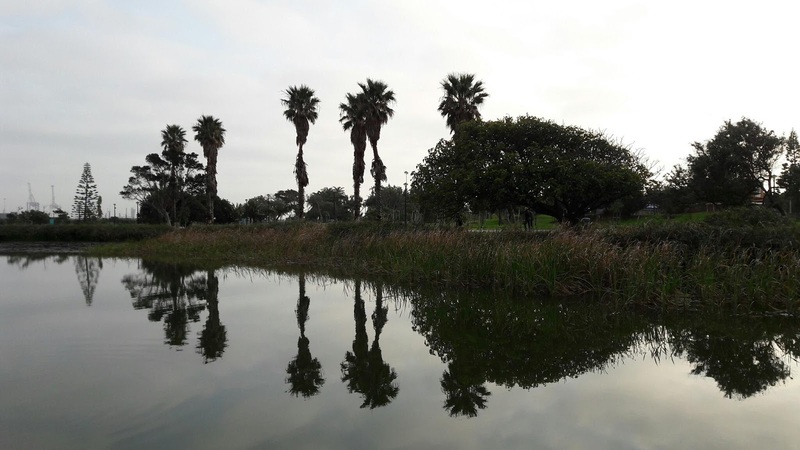 It is as if the palm trees in Kings Beach Park were planted there for photographers to get pics of their reflection in the lake. 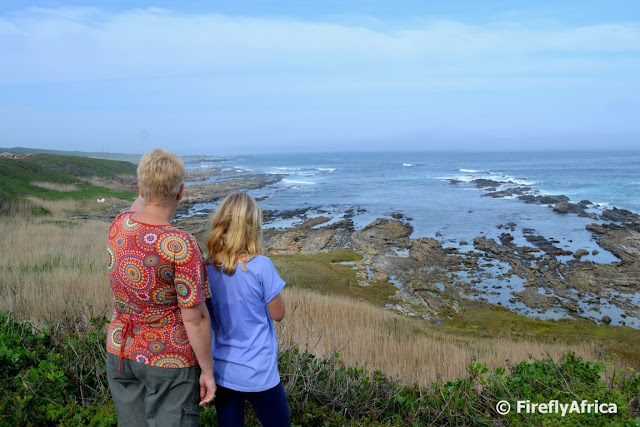 Nelson Mandela Bay Tourism has a brand new destination marketing video promoting the fact that Port Elizabeth with Algoa Bay and all it's adjacent game reserve truly is an African Wildlife Hotspot. At a recent tourism conference I attended, a representative of Kruger Lowveld Tourism in Mpumalanga implied during one of the panel discussions that the Eastern Cape doesn't offer visitors an authentic wildlife experience. 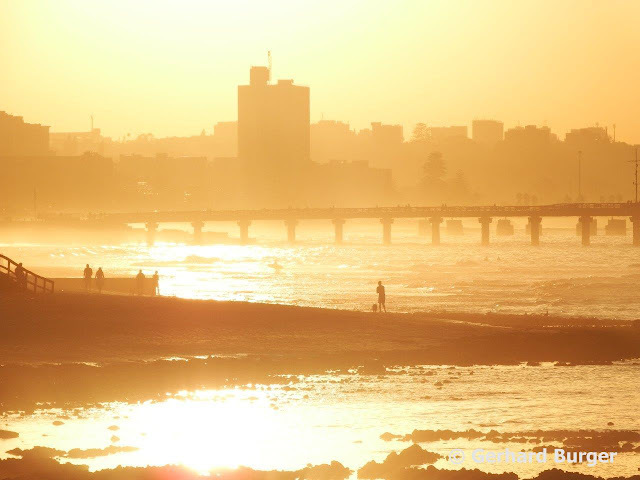 So let's see what Nelson Mandela Bay and surrounds have to offer. 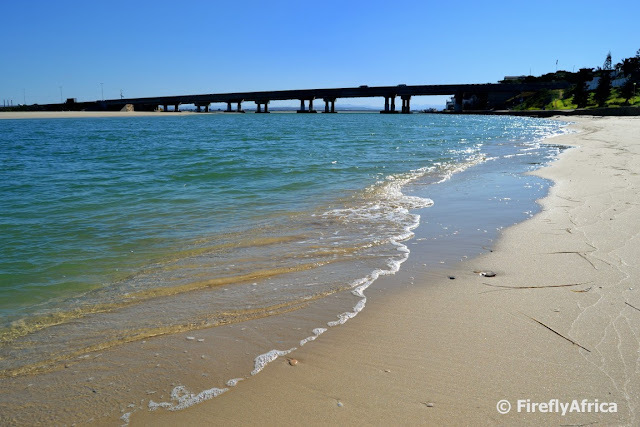 Algoa Bay with it's 40 km of magnificent golden beaches has one of the most diverse marine eco systems in the world. Bird Island is home to the largest Cape Gannetry in the world (110 000 breeding pairs) while St Croix Island has over 50% of the world's African Penguin population. Add to that the fact that Algoa Bay has been proclaimed as an International Hope Spot for the African Penguin, is the Bottlenose Dolphin Capital of the World and offers whale watching and excellent scuba diving opportunities. The area offers everything from rocky shores to indigenous floral fynbos, stretches of golden beaches and unspoilt sand-dunes (the Alexandria Dunefield is the largest coastal dunefield in the Southern Hemisphere) to lush indigenous forest and untamed wilderness areas. 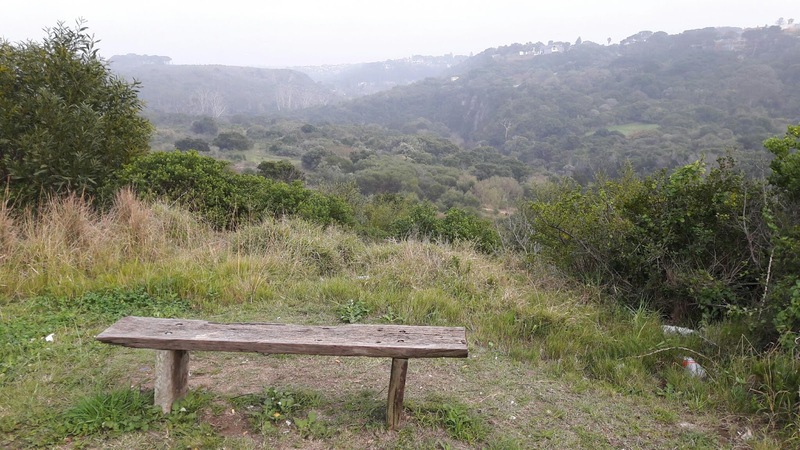 This all means that the nature reserves in and around Port Elizabeth offer a wonderful range of options to the great outdoors. Then there is the cherry on the cake. Addo Elephant National Park, home to the Big 7, and number of excellent Big 5 private game reserves within an hour and a half from the city means that this region has developed into one of South Africa's main game viewing destinations. Who needs Kruger and the Lowveld when the Eastern Cape has such an awesome and very much authentic (and malaria free) wildlife experience to offer visitors? Hello Aliens. Are you among us? Yesterday morning while taking a walk around Kings Beach Park, my eye caught this piece of graffiti at the top of the steps at the water feature. 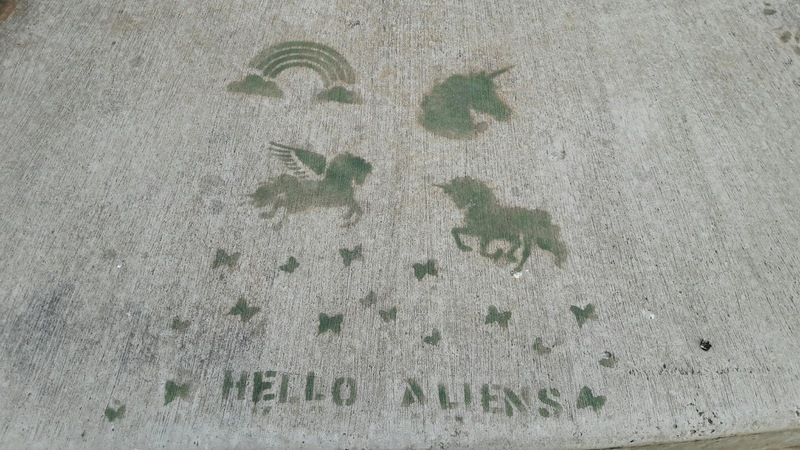 HELLO ALIENS along with pictures of a rainbow, pegasys, two unicorns and a bunch of butterflies. Does this mean that there are aliens walking among us or is it a welcome for an imminent arrival? Or are we just all aliens? I went for a quick early morning walk around Kings Beach Park before work and got stuck at the water feature next to the lake trying to get a picture of both the waterfall and the lake without getting my work pants wet. 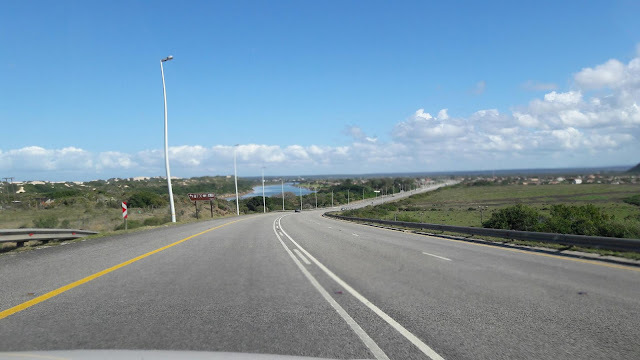 Regular Port Elizabeth Daily Photo follower Gerhard Burger sent me this picture last week. Isn't that just the perfect winters afternoon in the Bay? The harbour giraffes aren't the only giraffes you see on the beachfront. 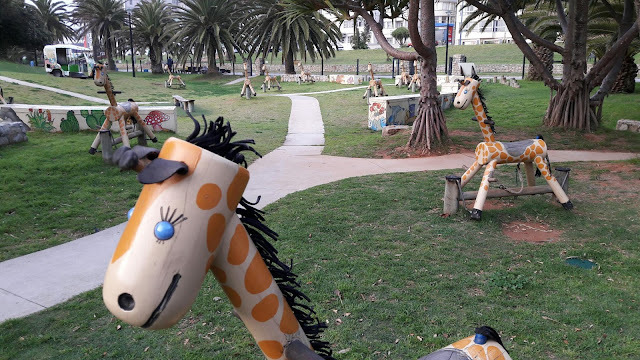 There are also twenty kiddie giraffe rides at the Kings Beach Park play area. 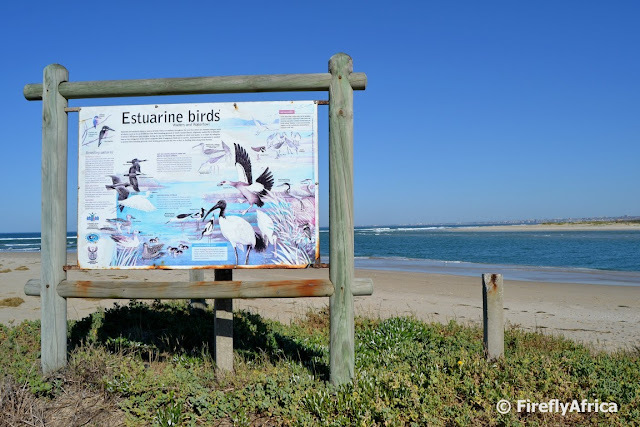 Not a lot of non-twitchers would know that the Swartkops River estuary is one of the best places around Port Elizabeth for bird watching. It is home to a huge amount of estuarine and water birds and the ideal spot to tick off a few feathered friends from your bird list. 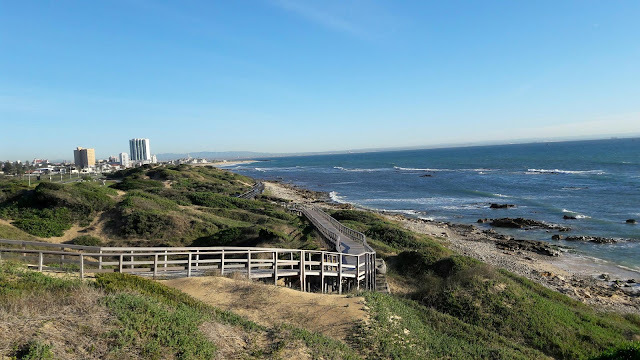 I needed to clear my head a bit this morning and took a walk across the road from the office and down onto Hobie Beach. Not a lot of people around to enjoy the view of the sun glistening silver on the slightly choppy sea. At least I could snap a pic to share with you. 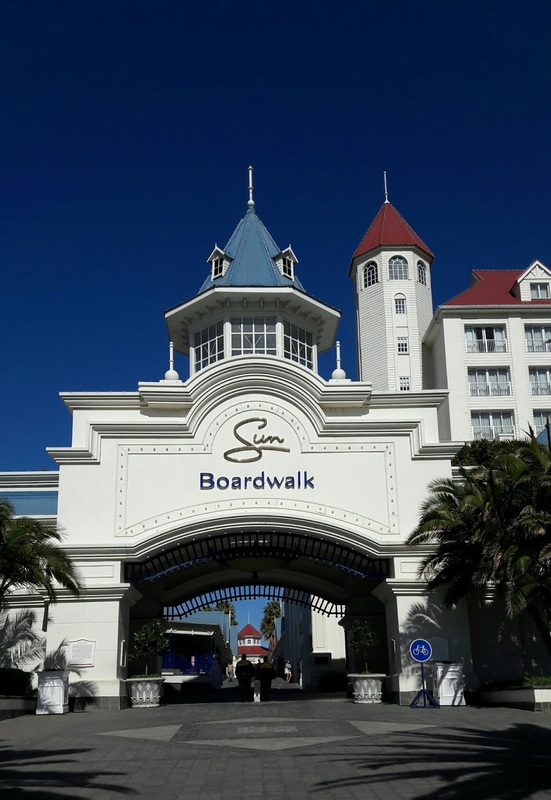 The Marine Drive entrance to the Boardwalk must be one of the most photographed landmarks in Port Elizabeth. My office is above the tourism info centre just on the left as you walk under the arch and I literally see visitors taking pictures of the entrance every time I go outside. Some of it on it's own, some in selfies and some with friends and family in it. But always featuring the entrance. 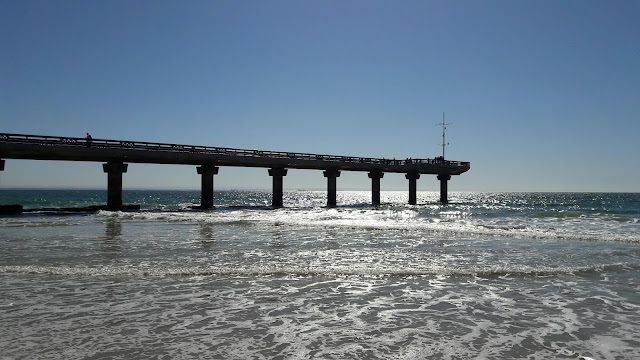 Perhaps the Boardwalk could put Port Elizabeth up there somewhere as well. 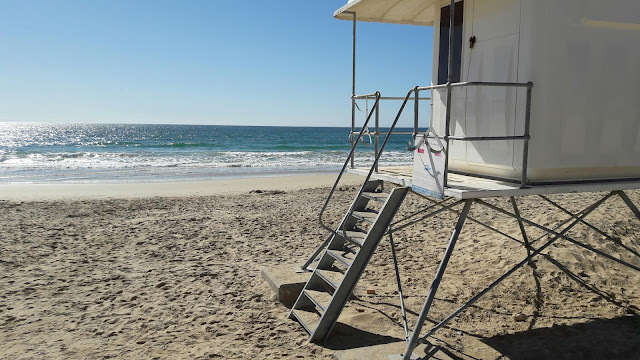 It's winter at the moment and the beach is pretty much empty, especially during the week. But the lifeguard tower, although not manned at the moment, is waiting. 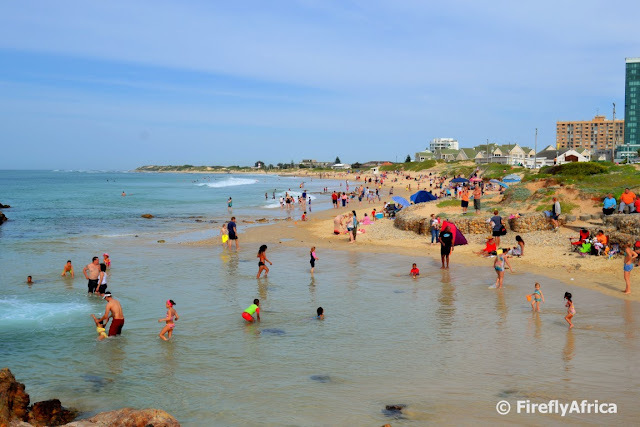 Summer will come again and so will the beach-goers. Tuesday morning I was out early to make my mark in the local elections. A little later the morning we headed over to Baywest for Drama Princess to join some of her friends at the ice rink. On our way though we did a quick detour to find a Geocache. The KidZ quickly, and slightly concerned, pointed out that it was pouring outside. No worries, if it rains then you head indoors. Or in this case, underground. 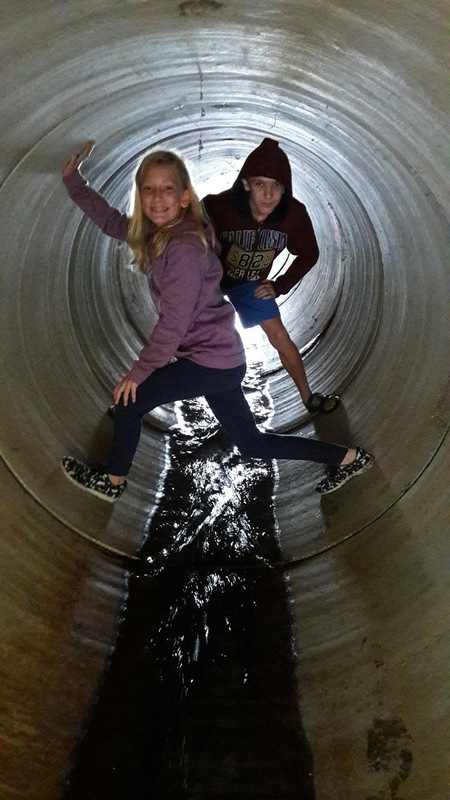 The cache being located just on the other side of a storm water pipe under the road (for the sake of this post and the Muggles reading it the location will stay undisclosed). So we literally went caching in the rain but under cover. Last week's Video Friday post featured a video by Chasing the Rainbow about a Kragga Kamma Game Park photo safari. This week we're sticking to the game theme with another Chasing the Rainbow video, this time of their visit to Kuzuko Lodge. 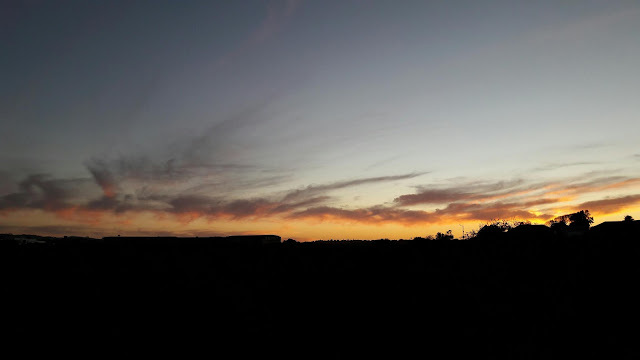 I had to go and drop Drama Princess off at school tonight for the last night of their school concert and this was post sunset looking from Newton Park side across the Baakens Valley towards William Moffet. 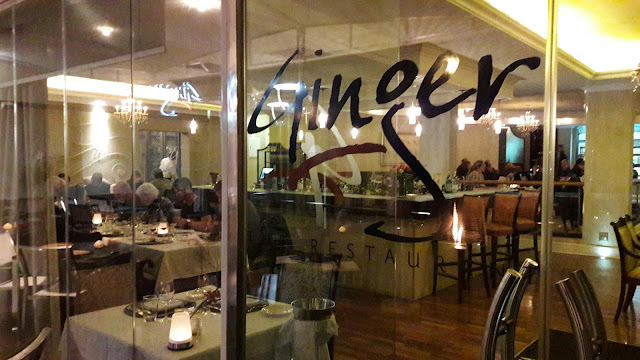 If you're looking for fine dining in Port Elizabeth you don't have to really look any further than Ginger Restaurant at the Beach Hotel across the road from Hobie Beach. The Damselfly and I were invited to come and try out their seven course relaunch set menu tonight. The restaurant has just had a complete refurbishment and along with a new award winning wine list, a menu to match, impeccable service and a very relaxed atmosphere, it definitely is a must for both locals and visitors alike looking for something a bit more - or more like a lot more - sophisticated than the local fast food takeaway joint. Drama Princess and all her fellow pupils (and obviously all the teachers) at Newton Park Primary School have been hard over the last few weeks rehearsing for the schools musical play that gets staged every few years. 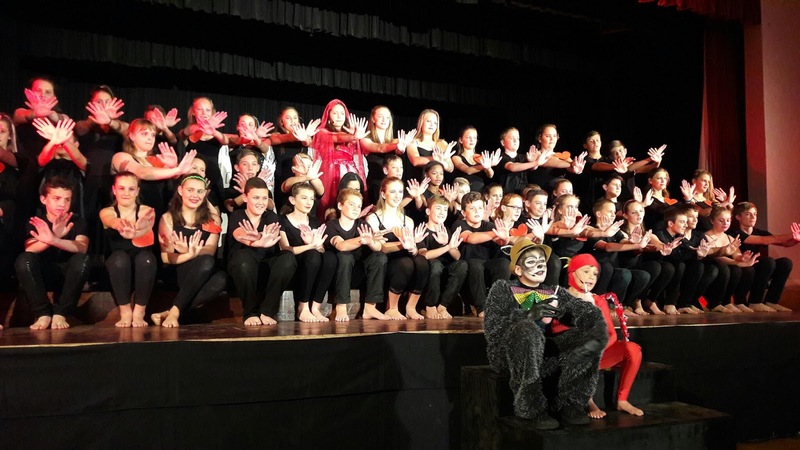 The production includes each and every child with each class contributing a different scene to the show. 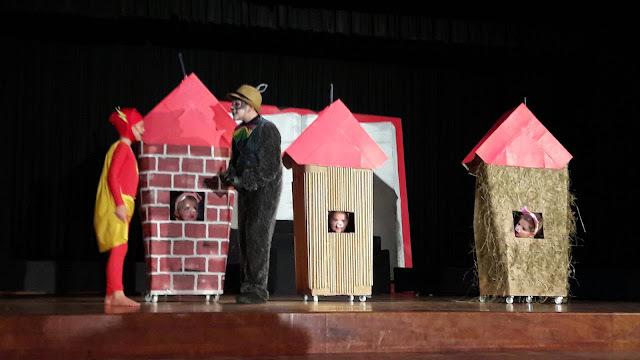 This year's story, being narrated by Little Red Riding-hood started with The Big Bad Wold getting bored with being the bad guy and walking away. He then changes his mind when he realised how boring his life had become and started a return journey along with superhero Flash. The production started last night with the second show this morning for a number of preschools, tonight's production and then the final evening on Thursday. Tickets for the shows have been sold out for every night and we were fortunate to have front row seats. The teachers and kids outdid themselves and although there is probably a lot of schoolwork to catch up on, they can be very proud of a job very well done. I are tired... tired is I. Probably more like exhausted. Makes it feel even worse when you go home, got to stop at the shop and join a queue of 30 people to buy electricity (yes I know I've got to register to do it from my phone if I can find the time), pick up one of the kids and rush off to drop them back at school for their school concert (which is going to be all week), then back home to eat something before rushing to buy milk before the store close and pick up Drama Princes again. Somewhere the sun went down way too early and I seem to remember that I snapped a pic to try and sum up my day. And that was just today. Did I mention the last few weeks have been something like that between work, family, work, kids, work, family, work and everything and everybody else wanting a piece of me? Say what? It's the first of August? Already? Or only? I need to recharge my batteries.